In February 1946 I teamed up with Leo Bennett and Willie Walters. 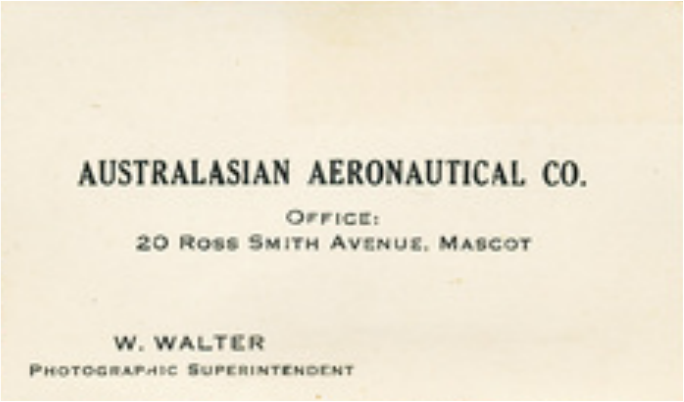 We secured a New South Wales certificate of registration for The Australasian Aeronautical Co. with offices in Ross Smith Avenue, Mascot. Leo was our Managing Director, our bagman Willie held the title of Photographic Superintendent, with my input as Flight Superintendent. Professor Gerhard R. Felser, then Consul General of Austria, arranged the registration of our company. He also prepared income-tax returns and became a life-long friend. Our best asset was a Genairco. It was a biplane with a roomy front cockpit that sat two passengers side by side, with the pilot operating from a rear cockpit. All were exposed to the elements. This was a joy-flight money-tree, particularly when operating from the abandoned wartime airstrips at Tuggerah Lakes, Albion Park and Goulburn. Chic taxis Wackett Trainer Virginia 2. Willie Walters oversees from the back. We paid the Receiver of Public Monies £A250 and became the proud owners of a Wackett Trainer. 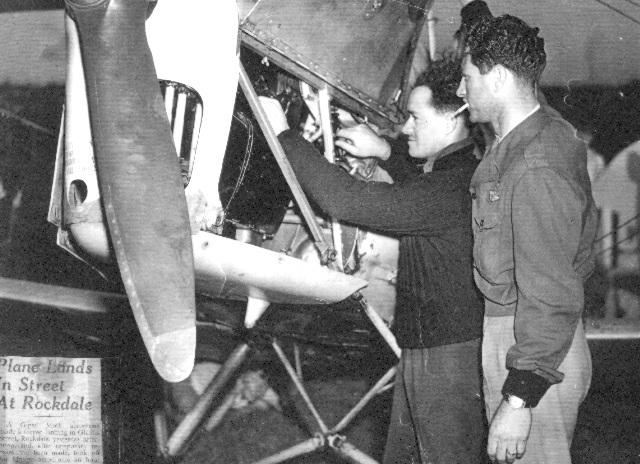 Leo and I rushed off to the RAAF Care and Maintenance Station at Narrandera, 360 miles from Sydney on the Murrumbidgee River, and with some trepidation I approached a Wackett Trainer for the first time. We successfully survived a hairy take-off due to a binding port wheel brake. Our take off path parted the hair of the terrified station commander, but thankfully, when we returned to the blocks he appeared to have calmed his nerves. Then dancing with rage he banished us from his field. Recognising the blazing eyes of a homicidal maniac Leo and I departed for Mascot. Safely in the air our compass failed. 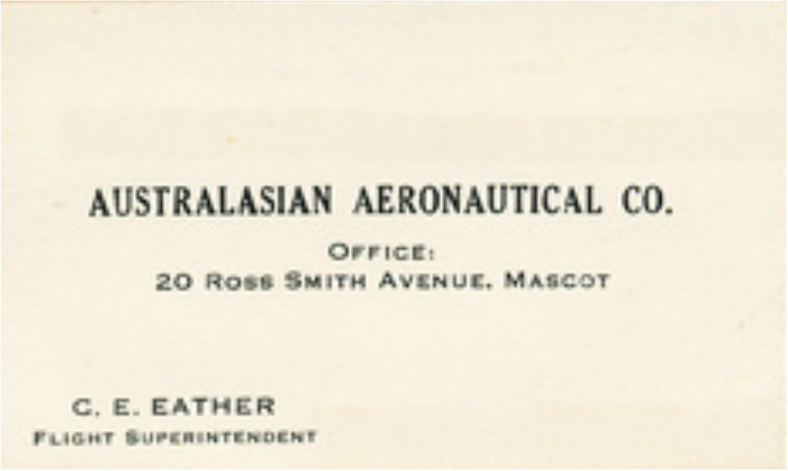 Good airmanship demanded I return to Narrandera yet the wrath of the station commander overcame my fear of the unknown skies that lay ahead. My logbook carries the entry steered by the sun, whatever that meant. Then to intensify our grief we ran into a violent electrical storm just north of Nowra. Oh, boy - I still had a lot to learn. Providence, as well as Leo, rode the co-pilot’s seat that day! The purchase of Tiger Moth A17/138 took Leo and I to the RAAF Care and Maintenance Station at Cootamundra. For umpteen miles her Gipsy Major engine did not miss a beat. Then with Mascot in sight she decided that her engine needed a rest. I set her in a glide that would produce the greatest distance and it seemed my haven of Mascot would prove the correct choice. As we drifted lower the bluish polluted air of suburbia produced niggly turbulence. I increased the glide and realised Mascot was slipping out of our safety envelope. Yet all would be well with a decrease in weight. My suggestion on how we might reduce the weight was met with stony silence. This came as something of a surprise, for normally Leo was the most cooperative of men. We both brightened up when, in a generous spirit of compromise, he tossed his decrepit pen overboard. 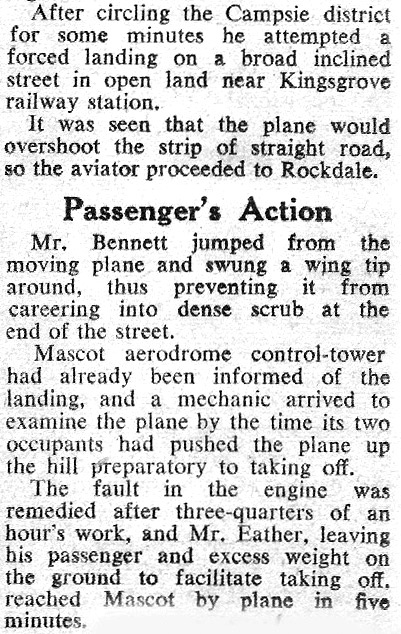 Further speculation ended when the ground intervened and the plane landed itself on a deserted track. The first on the scene was a grubby lad shepherded by a flea-infested dog of doubtful antecedence. Glamis Street Rockdale, a Sydney suburb. Some years later it hadn't changed much. 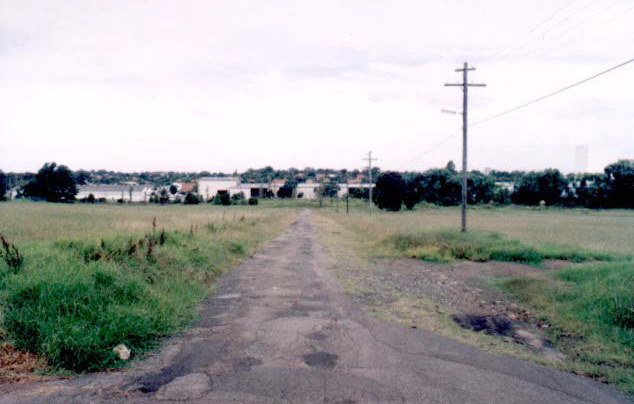 He disclosed we were enjoying the hospitality of Glamis Street in the glorious suburb of Rockdale – or words to that effect. A massive cop arrived on a motor bike and sidecar. He managed to spoil the festive atmosphere with a few well-aimed kicks up various bottoms. This was a timely gesture for a sizeable crowd had materialised and most of them had joined Leo and me in the cockpits. The lad’s dog was licking my left ear while simultaneously piddling into my left flying boot. 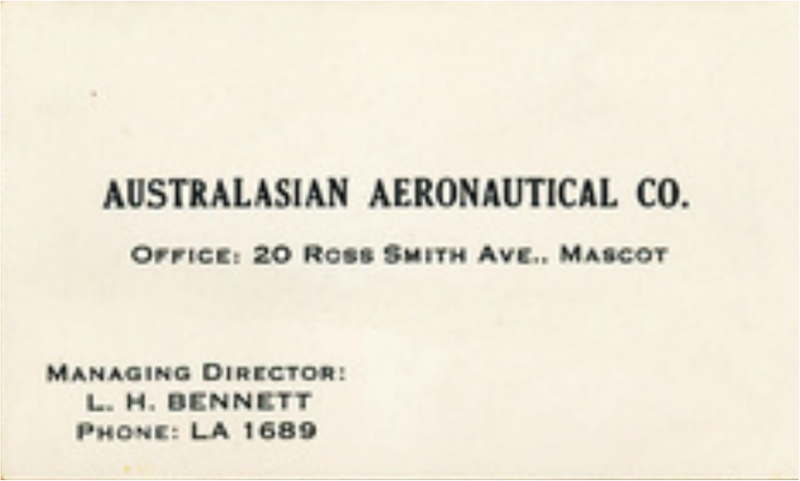 About 30 minutes later a mechanic from the Royal Aero Club of New South Wales answered our telephone call for succour. He blew out our fuel lines, jerked everything else with destructive glee and declared that I should start her. She caught at the second swing. Leo stayed behind, having decided his weight would dangerously extend my take off distance. The massive cop, now a pool of perspiration, jumped on his bike with the imperious injunction Follow me! By this time I had developed a hatred for this spoilsport. I rationalised that to pull up the inclined and heavily grassed track I needed more and more power. Glancing over his shoulder the cop began to increase his speed until his bike had reached its designed specification. I relented, he screamed off to one side, and refused to take further part in the entertainment. The rest is mere anticlimax. I took off with space to spare and within five minutes had landed at Mascot. I phoned the authorities inquiring if they wanted a report. 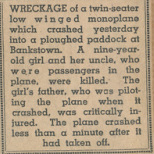 A voice asked if anyone had suffered injury then was the plane still recognisable as such and then told me to forget it! Those were the days. 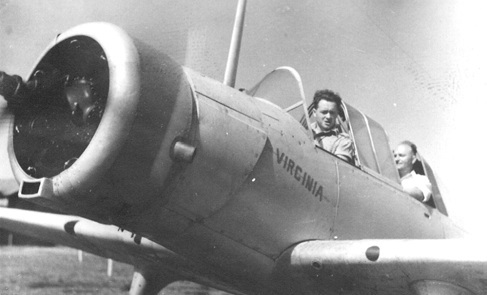 Arthur O’Hara, a flying mate and the Sydney Morning Herald’s staff aviation reporter, got our story. Arthur, true to his profession, took the facts of a simple accurate report nipped, tucked and expanded it to read as a death defying adventure. When my mother read his story her first reaction was alarming. I hope, she said, it wasn’t a publicity stunt. It wasn’t! She read it again and for several hours laughed at just two words – flying circles. I never understood why! Arthur O'Hara, staff reporter and photographer for "Granny Herald". 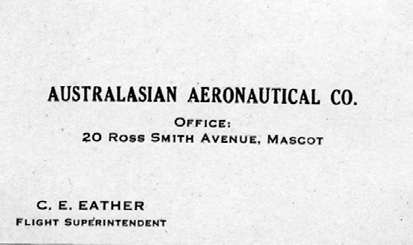 Arthur was a flying member of the Royal Aero Club of NSW. Mascot Airport. Though we three gave of our best, the air taxi side of the business proved a total flop. The only weekday assignments we ever managed were the occasional air-photography flight. Our choice of unsuitable aircraft had doomed us and in April 1946 we went into liquidation. I was a shattered and disillusioned man. Norman Bush, a carcass butcher and meat exporter from Homebush bought our Wackett Trainer. 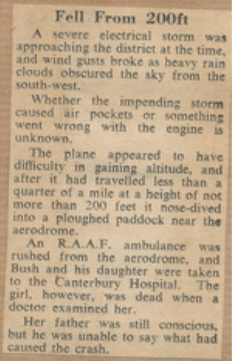 A pilot with limited experience and no respect for air legislation regulations, he wrote her off on 7 January 1947. 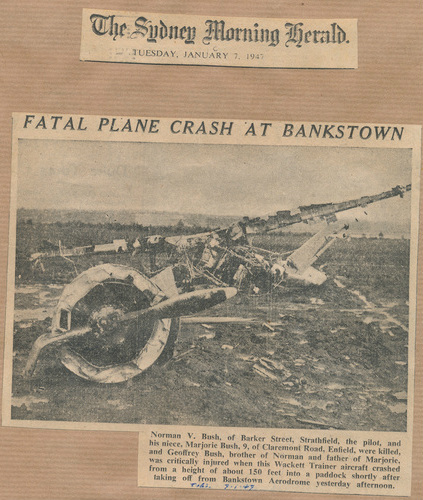 Soon after taking off from Bankstown his engine failed and he slammed into the ground. 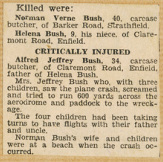 He and his nine-year-old niece were killed on impact while his brother suffered critical injuries. The plane was licensed for only two occupants. 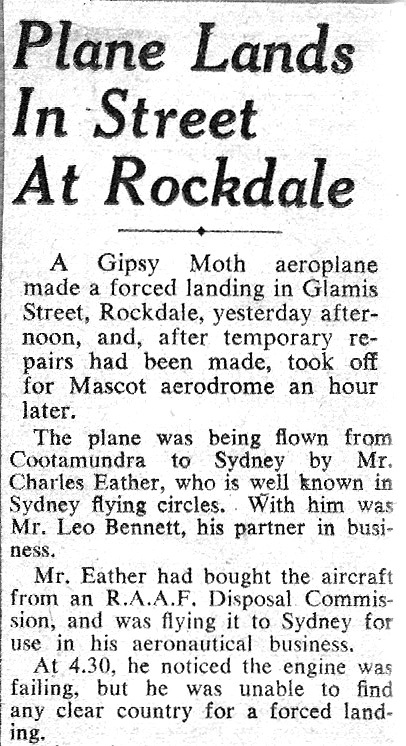 Daily Telegraph, Sydney, Tuesday 7 January 1947.